I decided to learn Python programming and I am going to spend the next 8 weeks or 56 days practicing it. Below I am posting a short update of what I did everyday. I created a GitHub repository to post the Python code of the things I’ve learned. Covered chapters 1 & 2 of the Automate the Boring Stuff With Python. Covered basic functions, boolean operators, if statements and for/while loops. Covered chapters 3 (functions) and 4 (lists) of same book. Covered chapters 5 (dictionaries and structuring data) and 6 (manipulating strings) of same book. I feel that I’ve easily covered the basics of Python up to this point. The language is similar to matlab so it hasn’t been too bad. Covered chapter 7. Text pattern recognition and manipulation/matching. This chapter is packed full of info. Covered chapter 8. Reading and writing files. I skimmed the lecture videos of the rest of the series. I wanted to see what I’ll be learning ahead. But over the weekend, a friend reminded me that learning happens by doing and practice. I have been spending 80% of my time watching lectures and 20% practicing. It was a decent strategy the first 3-4 days, because it highlighted the syntax, functions, loops and fundamental language of python. I was watching and taking a lot of notes. But now I want to reverse my strategy and work on ‘the doing’, practice by completing small projects. The rest of these 8 chapters I’d like to focus on 80% practice and 20% lecture. Learn by doing. Happy first of October. Today I learned how to use Selenium for automating web browsing. Here is a script I wrote for playing the popular 2048 game. I also followed a tutorial to write a fairly complicated script to play the Tic-Tac-Toe game. This is a great example for understanding loops and organizing your code by defining functions. Learned how to read and write Excel files in Python. See my notes. Learned how to read CSV files in Python. See my notes and this script that removes the first row of all your CSV files. Learned how to read JSON files in Python. See my notes. Worked on writing a script that calls an API from a weather data website and returns the weather data. Finished the weather Python script. Check it out on my GitHub. I wanted to make it fancy by using Regular Expressions and While loops I learned early to only allow alphabet characters in the input and quit if the user typed ‘q’. I learned a lot from this mini project. Learned about time in Python. See my notes and a stopwatch. Tried to automate a work project using selenium. Did some research on Python’s user interface modules such as Flask, Django and QT. Learned about local, enclosing, and global variables, aka nested statements and scope. Also learned about OOP (object oriented programming), things like __init__ and “self”, etc. See my bankAccount.py program. Starting to learn about flask and developing a website using HTML, Bootstrap and Flask. Working on a flask project, basicWebsite.py. Learning to work with Jypiter. I find that the GitHub files of the Complete Python 3 Bootcamp are nicely written and good tutorials to follow. The tutorial is available to purchase for $10 with the link from the GitHub notes. Completed a simple test assessment from the Complete Python Bootcamp course. You can find it here. Completed the Python loops statement test, if, while, for loops. You can find it here. Also finished Warmup-1 from CodingBat/Python. Completed the following from CodingBat.com/Python: Warmup-2, String-1, List-1. Read into folium to create an interactive map for a future project. Used Folium to create an interactive map of FL and used GeoJSON data to show the borders of each county. Worked on yesterday’s project. Updated the code to show the county name when you hover the mouse over the county. Used Selenium to scrape the last note added by examiners on hundreds of claims in our work websites. Used pandas to output the data into an excel spreadsheet for reporting the data. This task alone took me 3 days or more to accomplish. I was able to automate my browser to do it in 15 minutes. Great success! Learning the Pandas module for data analytics. Watched some more tutorials on the pandas module. Learned how to create Pivot Tables in Python using pandas. Analyzing stock data and visualizing it. Cleaning the data in Pandas and visualizing it with matplotlib and Plotly’s interactive charts. Analyzing stock data and visualizing it. Using an API to grab real time data of the top 100 cryptocurrencies. Used pandas to work with the data and publish it as an excel spreadsheet. I would like to figure out how to implement Tkinter to create a GUI for displaying the data. Read about Deep Learning. Looked into TensorFlow and Hadoop. Used OpenCV to resize dozens of images I had saved into my computer into a smaller size, i.e. 250×250. Did some simple tutorials with tkinter, Python’s GUI. Explored Python’s Tkinter and PyQt. Learned about Generators and Iterators. The yield function. Learned how to run .py files from Jupyter Notebook. Learned about raising errors and exceptions. The __Name__ and __Main__ purpose. I reached my goal! 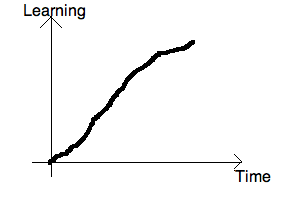 The learning curve in the beginning was high but as time progressed, the curve became steeper and steeper. The learning does not stop here! Even though I feel like I’ve barely scratched the surface, I think this was a great introductory bootcamp into Python. The most important lesson I got out of this “experiment” was the importance of consistency and the power of compounding. In conclusion, I learned a lot about Python’s capabilities and I’m really looking forward to utilizing it for future projects. I’ve already incorporated Python into my personal and work life. I learned about web-scraping, web-development, data-analytics, GIS, computer-vision, machine-learning, GUIs and more.